This chapter presents a case study of the preparation and passage of Kenya’s Seed and Plant Varieties (Amendment) Act in 2012. It begins by identifying the main differences between the previous laws that governed seed sovereignty in Kenya and the provisions of the new law. It then describes in detail the process by which the 2012 law was passed. It ends with a detailed analysis of the main actors involved in the decision-making process and their motivations. It reveals that the 2012 Kenyan seed law is consistent with a hyperglobalist interpretation of seed sovereignty. Kenya ceded proprietorial rights over seed to international corporate and commercial interests. ECAPAPA-IFPRI Brief. 2006. Based on Minde I. 2004. Harmonizing seed policies and regulations in Eastern Africa: experiences and lessons learned. Entebbe, Uganda: Eastern and Central African Programme for Agricultural Policy Analysis. https://www.ifpri.org/themes/ecapapa.htm (accessed online 2012). GRAIN. 2005. Africa’s seed laws: red carpet for the corporations [Online]. 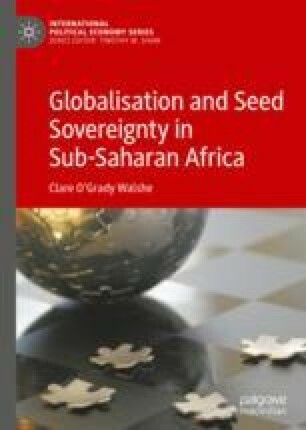 Available from: https://www.grain.org/article/entries/540-africa-s-seeds-laws-red-carpet-for-corporations [Accessed 11th November 2014]. Kenya NPT regulations (2009). Seeds and Plant Varieties (National Performance Trials) Regulations, 2009. Available at http://extwprlegs1.fao.org/docs/pdf/ken37547.pdf. Accessed 14 March 2019. The Constitution of Kenya. 2010. The Constitution of Kenya, 27 August 2010, available at: http://extwprlegs1.fao.org/docs/pdf/ken127322.pdf. Accessed 14 March 2019. USDA Foreign Agricultural Service. 2008. Kenya planting seed report. GAIN Report number: KE8010. Waithaka, M. and Kyotalimye, M. 2013. Harmonizing seed policy in Eastern and Central Africa [Online]. Available from: http://knowledge.cta.int/Dossiers/S-T-Issues/Seed-systems/Feature-articles/Harmonising-seed-policy-in-Eastern-and-Central-Africa-lessons-from-a-public-private-partnership-model. [Accessed 28th April 2016].